If you graduated high school when Matchbox 20 topped the charts, you’re a Millennial, and pundits think your age group could decide who the next leader of the free world will be—no pressure or anything. Whether you support Hillary Clinton or Donald Trump, you should be interested to know that demographers have taken account of the entire US Millennial population. 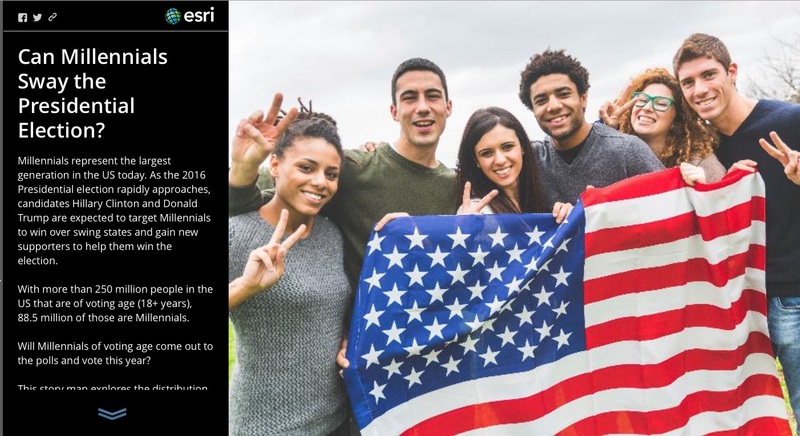 Two interactive maps embedded in the Esri Story Map Can Millennials Sway the Presidential Election? expose the election-deciding potential of one of America’s largest voting blocs. Unless Millennials stay home in apathetic droves on Election Day, the millions who comprise this generation will help swing the fence-sitting states one way or the other. Both Clinton and Trump know this and, unsurprisingly, have spent considerable money courting this age group for support. With 14 politically agnostic states to sway before November, it doesn’t take a mathematician to see why both parties covet Millennial votes. Appropriately, the second page of Can Millennials Sway the Presidential Election? introduces the core of the story—a national map starkly represented in red, white, and blue. Each state in the map is clickable to show the percentage of Millennials in each electorate. While red and blue states typically vote for the candidate of their predominate parties, the white states are the swing states on which the election is likely to hinge. Clicking one of them displays a pop-up window with the numbers that give insight into why this generation is so targeted. Arizona, for example, shows more than five million eligible voters, of which almost two million are Millennials. That’s a lot of eligible voters that need to be wooed by Election Day. The story map also contains charts and graphs showing the distribution of Millennials and the extent of their political involvement across states, counties, and census tracts. As generations age, they tend to shed their voter apathy, but one of the more interesting patterns revealed in the data is that from 2008 to 2012, Millennial voting rates dropped three whole percentage points (from 45% to 42%). How significant is that decrease? It’s not entirely clear, but Pennsylvania seems to reveal a nuanced answer. Pennsylvania ranks second among states for having the largest number of voting-age Millennials. Esri includes an interactive map of Pennsylvania that peers into its State College area, home to Penn State University. This map can be drilled into, revealing the number of voters by census tract and the Millennial percentage. Interestingly, the map also reveals an unusually high rate of political participation in the area, such as rally attendance and petitioning of state senators and congressional officials. However, the map shows none of the corresponding increase in voter participation that one might expect. Conversely, populations in the immediate outlying (non-collegiate) area show both high political participation and high voter turnout. Such findings aren’t black and white but are generally consistent with how the patterns of voting behavior differ between younger and older generations. Will political cynicism overtake Millennials, or will both campaigns generate the heat needed to drive former Slipknot fans to the polls? Only time will tell, but it’s all undeniably fascinating, and the story map is a window into the numbers that will affect one of the most important election years in recent history.